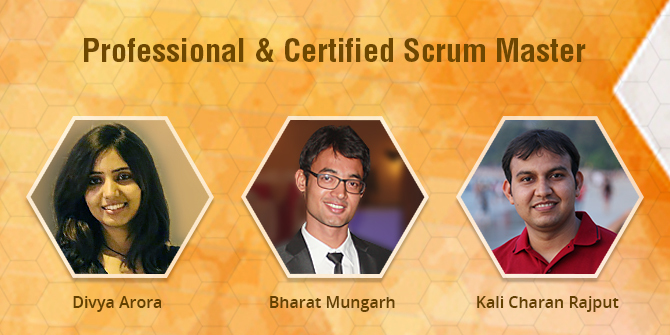 Ranosys is proud to announce the accomplishment of SCRUM Master certification by three of its Team Leads – Divya Arora, Kalicharan Rajput, and Bharat Mungarh. This certification stands testimony to their project management skills right from project planning and control, client communication to delivery. They have been instrumental in promoting the principles of Scrum and other project management methodologies within the organization. Scrum is a software development methodology in which the product development is done in iterations as compared to the sequential approach adopted in the waterfall method. It makes it more agile and flexible to adapt to changing requirements and priorities and unforeseen challenges. It is, therefore, considered most suitable for managing the product development and requires close collaboration with all key stakeholders to work as a unit. “Thinking hard and adopting all parts of SCRUM on a daily basis in projects, it took me about 6 months to effectively learn the nitty-gritty of SCRUM and finally, I took a step forward to achieve the CSM certificate. It is the result of many sleepless nights to effectively achieve the Scrum Master Certificate,” said Kalicharan Rajput. Ranosys is committed to adding value to its clients business. Adopting project management methodologies like Scrum will help our clients reap the benefits by ensuring improved quality of the product, faster time-to-market, and better risk management.